Soon after Jeff and I were married I went back to night school to get an MBA while I continued to work full-time. Something had to give so I hired a cleaning women to come once a week - a luxury my mother never had. This “habit” stayed even after I finished school and we've had some great people over the years. For the past 5 or 6, we've had Val. Val's job is to come once a week to keep the dog hair to a gentle roar, make sure my bathrooms are not conducting any science experiments, and administer the required amount of belly rubs to Dylan (who complains that she loafs on the job). I love Val because she helps keep my life in order and she's a wonderful person. Almost two weeks ago we said goodbye to Val. She's filled our spot with other clients with a promise to fit us in if she can when we return - I'm trying hard not to wish any of them harm. I moved this funny looking rubber brush-like thing around the “dog bin” for the past couple of cruises. 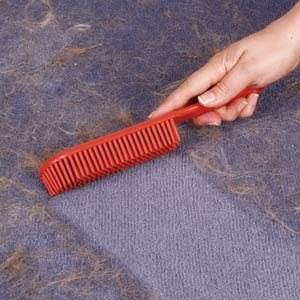 Finally, the other day I tried brushing it across a cushion and was stunned at how the dog hair came up. It's called a Sweepa and even has a sharp edger for pulling the hair out of cracks. I'm adding it to "Products and Tips We Love." I honestly don't know where I got it but they do have a web site (http://www.sweepa.com/). Don't worry Val, you're still irreplaceable. The Sweepa can't do belly rubs. 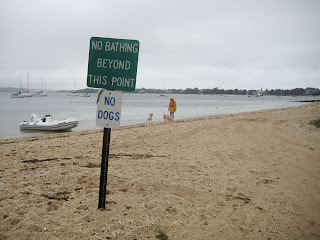 ActiveCaptain warned us that the beach at Northport (Asharoken Beach) didn't allow dogs. 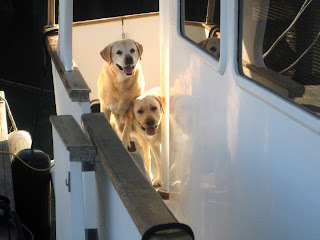 The town of Northport just didn't understand though - these dogs have been on the boat for a solid 4 days. There wasn't an option of "No Dogs" at this point. By 7:00 am we were all in the dinghy headed out for a stealth beach landing. By 7:15, everyone within a 2 mile radius knew that Dylan was retrieving items from the water. He needs some stealth training. The sky is nasty looking and there is rain spitting from the skies. The water temperature is a nice 70 degrees, very different from Maine ocean temperatures. To be honest, the dogs showed no preference. They loved the swimming. The storm is projected to have 20 kt winds here - almost nothing. There isn't even a small craft warning for the area - it was called off last night. There's just a lot of rain coming. Karen walked Dylan down the beach which gave me a rare moment to allow Dyna to retrieve her bumper from the water by herself. Dyna is an excellent swimmer but at 11 years old, she can't compete with 2 year old Dylan. I know she loves swimming with Dylan but I think she felt a little more joy by being able to get the bumper first and bring it all the way back. She deserved that moment. By lunchtime back on the boat, the canine crew was exhausted and sleeping. We'll try another swim tomorrow and go into town to explore and search for bread and vegetables. We awoke again at 5:00 am with plans of heading out to Sandy Hook. The latest forecast showed that Danny was going to be much less of a threat to western Long Island - there was almost no chance of 50 MPH winds. We now had a lot more options. Going to Sandy Hook would mean we'd be stuck on the boat with almost nothing around for a few days. It had already been more than 3 days since we'd been off the boat and the team was in need of exercise, especially Dylan. Northport, NY has a wonderfully protected bay area. ActiveCaptain had a couple of anchorage areas for it. We've anchored ourselves in one of them before. 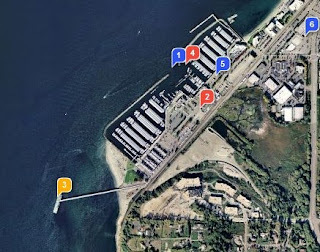 Northport also has a town dock, a beach, restaurants - it would give us much more to do. We figured we'd be stuck because of the storm and rain for a few days. Everyone voted to change plans and go there instead. The route to Northport is only 35 nm away. Leaving by 7:00 got us anchored in the harbor by noon. We have almost a quarter mile between us and the closest other boat anchored here. With 250 feet of chain out in 11 feet of water, this would be an excellent place to hunker down and ride out any storm. It's times like this that I'm happy we installed that new monster Rocna anchor. It was a cloudy day with no waves and no wind. The perfect type of day to move the boat from one place to another. Once again our crew was ready at a moment's notice for anything. Well, as long as you had enough time to wake them up or allowed them to finish playing their cell phone game. We spent most of Wednesday night planning our options for tropical storm/hurricane Danny. The current path shows it headed directly for Long Island, perhaps a little east. These things have a way of moving out to sea further to the east so we decided that the best plan would be to move west. And move west as fast as possible. The weather outlook is pretty good for the next 2 days. That gives us a nice set of options - but we have to move now. We have to get as far west into the Long Island Sound as possible today. That would allow us to get to Sandy Hook, NJ on Friday or head up the Hudson River to Yonkers if the storm moved west toward New York City. Once in Yonkers, we'd have another day to get deep into the Hudson River with little chance of great storm damage because of the land barriers. Either way, today was the day to move west. We awoke at 5:00 am (yikes!) and were pulling up the anchor at 5:45. By 6:00 we were heading out of Cuttyhunk's protected harbor. It had been a dead calm night - it would have been nice to stay here another day. Our destination was 85 nm to the west to Joshua Cove off Sachem Head, CT. All projected winds were from the north there for today so anchoring off Connecticut would give us the best protection. It was a beautiful day with no waves beyond the slightest ripple. There was a lot of sleeping going on especially by our canine crew. We picked up some wonderful current around "The Race" at Fishers Island which sped us to our destination. By 4:00 pm we were anchored and enjoying the stillness and incredible homes lining the cove. All eyes are glued to NOAA forecasts and the National Hurricane Center right now. We arrived at the town dock at 7:30 am to find Larry waiting to take us to our boat. That was good. While loading the boat, Dylan decided to jump into the water soaking all of our clothes - this while still tied to the dock. Definitely not so good. Upon dropping us off at the boat, Larry had one final set of instructions - "Keep her off the rocks" - definitely good. We unhooked the mooring lines at 8:30 am - right on schedule. It was a beautiful morning and a bunch of friends waved goodbye at the town dock - all very good. Leaving Rockland we experienced 2-4 foot rolling waves - we call them rollers. They rise slowly and fall slowly. It's a nice gently motion. More good. How much good do we deserve in a single day? Two hours before sunset we arrived outside Monhegan Island. This is our final go/no-go position before heading overnight across the Gulf of Maine to Cape Cod. There was no change in the weather prediction and the 4 foot rollers continued. Even more good! It turns out, we used up our allocation of good. About 2 hours after sunset, the period of the waves shortened from 8 seconds to 4 seconds (and less). This turns those nice gentle rollers into choppy, nasty, up-and-down motion. The waves were all coming on our nose too. Straight-at-you waves are the safest bad weather condition but they are mighty uncomfortable. We had 12 more hours of this type of weather to face. This was certainly in the not so good category. In fact, it was worth 10 not-so-goods. Within 2 hours, Karen was sick. I felt queasy but was OK. The dogs had never been in bad weather and took it wonderfully. We gave them some preventative sea-sickness medication that would make them a little drowsy. They didn't like the motion but they were really great. Karen couldn't do her watches and I had to pilot all night in the dark against those waves with no sleep. Make that 50 not-so-goods. 10 isn't enough. By 9:30 the next morning, we were in the protection of Cape Cod and the weather was light. I gave the helm to Karen so I could sleep for a couple of hours before piloting through the Cape Cod Canal with close maneuvers and other boats all around. We eventually found our way to a calm cove off Cuttyhunk where we dropped the anchor, ate one of the three meals we missed, and tried to brush ourselves off. The anchorage was beautiful, the sunset was golden, and all was happy again inside aCappella. Very, very good. That lasted all of 10 minutes - Hurricane Danny is aiming right at Long Island and set to hit in 3 days. The not-so-goods won today but we've only just begun this joust. The boat is ready. The house is ready. We've gotten everything we're going to get for departing. We just have to do a final loading of perishable foods this afternoon, top off our water tank, and disconnect the mooring pennant. The dogs know that something is up. 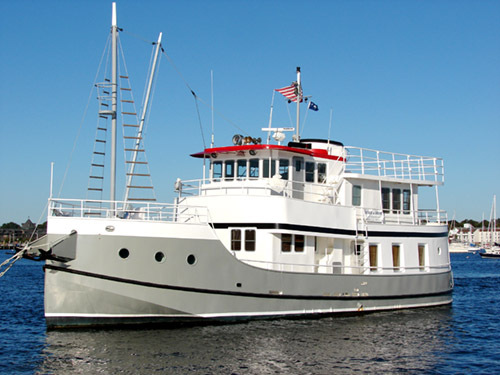 We plan to leave tomorrow at 8:30 am headed for Rockland, Maine to quickly top off our fuel tanks. By loading up with fuel now, we won't need fuel again until we're on the Chesapeake unless we come across a good price somewhere. We need to leave Rockland by 1:00 pm to get long past Mongehan Island by sunset. 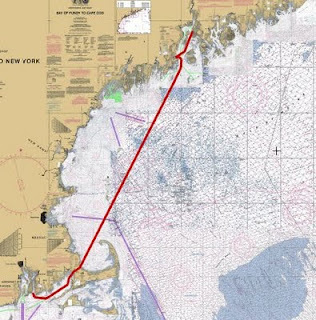 Then we'll be making a straight line from Monhegan to the Cape Cod Canal approaching Cape Cod at sunrise and entering the canal around 9:30 am. Our departure delay of a couple of days will cause us to now be against the current on the canal slowing us down significantly for those 10 miles. Once in Buzzards Bay we plan on heading to Third Beach (ActiveCaptain reference here) off the Sakonnet River to anchor for the night. We've never been on the Sakonnet River or near that anchorage before. But is has a 4 star rating by 3 captains. 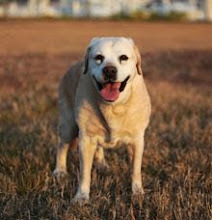 We especially like the comment someone made about there being a "pet friendly beach". It's both sad and exciting to leave. We'll miss our friends, Castine, our house, long hot showers, high-speed internet, DVR, and our general routine. 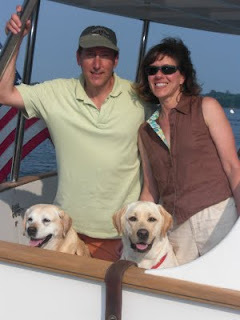 The dogs have a huge surprise coming when they take that dinghy ride to the boat expecting a fun day trip only to find that they're not getting off - and not even stopping for the night. It'll certainly be a change. But we'll all be together. We'll face the challenges and share the joys of whatever comes our way. 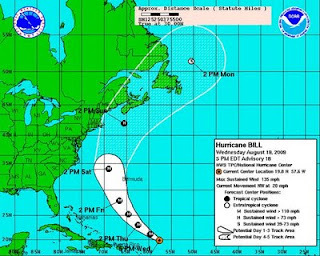 We're still waiting for Bill to make his way up the east coast. The predictions here in Maine are for rains and winds to start tonight through Sunday. He's moved further east and slowed down so we're hoping the seas will settle down Monday allowing us to leave first thing Tuesday morning. In the meantime, we're taking the final preparations a bit slower and taking some downtime with our friends. We've had some parties, big and small, and went to see the new Meryl Streep movie, Julie & Julia - Karen loved it (Jeff says "chick flick"). This afternoon we found time to give the dogs a final bath. Can anyone explain why dogs who absolutely love being in the water hate being bathed? But they smell awful sweet right now. We were left a comment asking advice about the "poop deck" for the dogs. We have an article describing all about the technique we used. 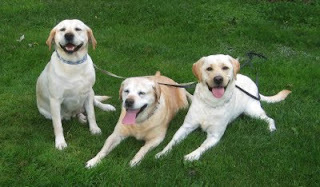 Check out Canine Crew on the web site. If you'd like a reply to your comment, please make sure you leave us your email address! MadMariner and Navagear did a review comparing ActiveCaptain to 3 other similar sites. Tim did a good review and we'll take the A-. Tim would have liked to see a "Hazard" type of marker added to our site. We know it's needed too. In fact, it's already in the X Preview tab which is the next version of our Interactive Cruising Guidebook. 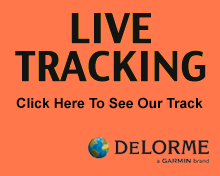 As cruisers ourselves we know that up-to-date information is critical to safe passages. The reality is that the official nautical charts don't get updated often enough with the data we need. It's up to all of us to help each other. That's the whole idea behind ActiveCaptain. 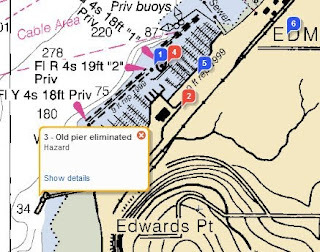 In fact, Tim's "Old pier eliminated" hazard is already in X Preview along with many others through the Atlantic ICW. This new yellow/orange hazard marker will become live for everyone when we make X live. We're getting closer to having that complete. Note also how X Preview shows the new hazard marker on top of real NOAA nautical charts. We think this will be one of the most important additions to ActiveCaptain ever made. We also think that our pre-loaded, already available markers for every marina and thousands of anchorages is a huge benefit to any cruiser planning their adventures and cruises. Added with that are all of the reviews, thousands of them, giving personal experiences and impressions. As we are planning our day-to-day movements now, those are the things that we find most important. It's nice to see our web site in print! And the suggestions in reviews like Tim's make us work harder to produce a better product. Hurricane Bill is churning up the waters off the east coast so we have postponed our Friday departure. There's even a possibility it could hit here in Castine. We're considering putting aCappella on our storm mooring tomorrow or Friday. Our next possible departure date looks like Tuesday the 25th. So we wait, visit some more with friends, and hope he hurries his way north. We're in what we thought would be our final week - Friday, August 21st being our take off day. So we planned some day cruises with friends to say good-bye. While we're looking forward to the trip, we're also going to miss those back home. 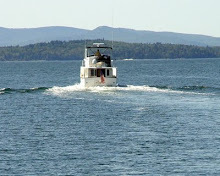 We had two beautiful days cruising around the Penobscot Bay. 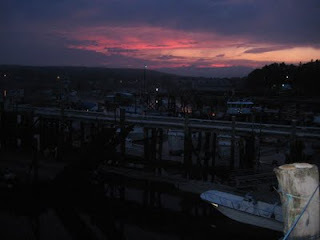 Our friend, Marion, took this picture after we pulled into the dock one day. I think it's a pretty good looking crew! While we're almost ready to go, it seems that Mother Nature has some other plans for us. The weather is deteriorating as the week goes on so Friday is looking like a "no go." We're actively watching the building disturbances in the Caribbean with Hurricane Bill too. We're still moving ahead as planned. That way if the weather clears we can go and if it doesn't, we'll have some down time before we leave. No more projects are left - we're simply loading clothes, books, last minute supplies, readying the house, etc. On Tuesday we left for Carver Cove to do some testing with our new anchor. We wanted to really understand how it worked and how working with it might differ from our other anchors. Carver Cove is a good spot for this as it's a large cove with good water. Tuesday night we were the only boat anchored there - even better. 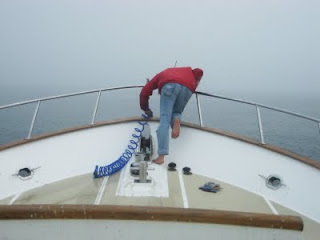 We pulled in around 5:00 PM and set the anchor at a variety of scopes, at first trying to make it not set and skip along the bottom so Jeff could know what that felt like. Whenever we anchor Jeff does the bow work while I handle the helm. When we finally let her set, she really did set. Putting the engines in reverse didn't cause us to move an inch. The night was calm but we still wondered how hard it would be to haul anchor in the morning. Rocna's have a reputation for being a bear to free - the reason we got it actually. We were up early Wednesday morning and found the process went very smoothly. Using the engines, we were able to free the anchor fairly quickly. It also gave the prefect chance to use our new saltwater wash down. Jeff says he's in love. It's a good thing I'm not the jealous type. There is still an issue with positioning the anchor and chain as she moves in and out to ensure the chain stays on the winch. Jeff and Larry are working on that one so I'm sure a solution is coming. The kids did great. They're settling in and finding the spots they like - the bow is a favorite for sniffing those good sea smells. We tried feeding them while underway (something our last crew mate, Tucker, never liked doing) and they finished in their usual rush. They both seem to understand the "poop deck," although Dylan still waits for Dyna to go first. He seems a bit unsure whether or not it's OK. We stuff our pockets with treats so I'm sure he'll feel more confident soon. 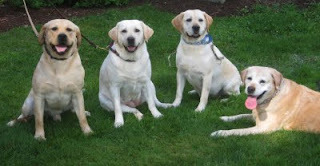 When we returned home, the dogs were loaded into the car for a ride to Bangor. We had a promise to fulfill for JoDee -- a four generation picture of Dyan, daughter Katie, granddaughter Daisy, and great-grandson Sarge. Of course, we also took the opportunity to get Dylan with his grandma Dyna, and mom Katie. Dyna has certainly created quite a "Dynasty"! Last week was Engine Week. On Sunday we left in pea soup fog for the 4 hour trip to Downeast Diesel in Southwest Harbor. 6 hours later their dock emerged from the fog. The mechanic, Bernie, spent all day Monday in the engine room - new belts, adjusted valves, new idler pulleys, new thermostats, a thorough going over and both engines were declared ready. We love Downeast Diesel. They're excellent mechanics and charge fair prices. The owner, John, has even talked us through some problems via phone. If you're in Maine and need diesel work, they're the only place we'd suggest. While all this was going on we attacked our projects list and made quite a dent. About 20 projects came off the list making us feel more relaxed about our take-off date. The lazarrette is cleaned and organized, a new switch was installed for the new chargers, the engine room spares have been sorted and cataloged, etc., etc. It was also a very successful trip for Dyna and Dylan. Both successfully manage the "poop deck" while lots of treats were dispensed. They made friends with the two boatyard dogs, Tank and Rocko. And of course were right there to supervise all activities. 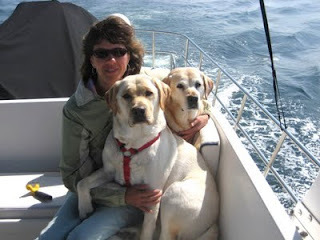 We returned to Castine on Tuesday a perfect boating day that made us long to turn west and keep on going! We have worked the rest of the week on cleaning the engine room - there was lots of mold and mildew from all our wet weather - and brushing and sanding the engines in preparation for painting next week. Jeff likes to paint the engines every couple of years. I must admit that the first time he proposed this to me I thought he had really gone over the deep end about the boat. But having a "spotless" - more or less - engine room has made it much easier to notice and track down problems we have encountered. It's a pain to do but adds to the peace of mind factor so it's worth it. I have started the provisioning process in earnest and hope to blog about it soon as several people have ask how I do it. I can give you a hint, it involves lots of lists.